Another recipe favorite from my best childhood friend’s Mom. She was like a second mother to me and was one of the best cooks I’ve ever known. Here’s to you Leila! Shape crumbly mixture into four equal disks. Wrap each disk and chill 2 hours or up to 2 days. Roll each disk into a 9-inch round, keeping other disks chilled until ready to roll them. Sprinkle round with sugar/nut mixture. Press lightly into dough. With chefs knife or pizza cutter, cut each round into 12 wedges. Roll wedges from wide to narrow, you will end up with point on outside of cookie (they’ll look like crescent rolls). Place on ungreased baking sheets, and chill rugelach 20 minutes before baking. 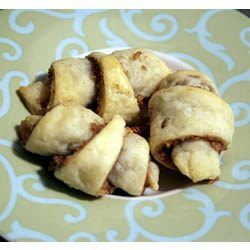 Preheat oven to 350 degrees F. After rugelach are chilled, bake them in the center rack of your oven 22 minutes until lightly golden. Cool on wire racks. Store in airtight containers…they freeze very well.